Don't look now, but the Fighting Illini baseball team is poised for their first Big Ten Conference title in several years. The Illini, who begin a pivotal weekend series at Illinois Field against the Ohio State Buckeyes, come into the contest with a 31-14 record and are in sole possession of first place in the conference, made possible by a sweep of Northwestern last weekend in Evanston. It has been a banner year for the Illini for many reasons, starting off back in March by taking 2 of 3 from the top team in the nation, the LSU Tigers. Normally it is too early to tell what you will have in those first couple of series', but it was just a sign of things to come for this squad. Head coach Dan Hartleb seems to be putting it together the right way, and with a 14-4 record in the Big Ten, they could wrap up the title by defeating the Buckeyes. The Illini welcomed the Evansville Purple Aces to town on Wednesday evening, and the Illini were upended 4-3 in 10 innings. Dominic Altobelli extended his hitting streak to 15 games, 12 of those in which he has produced an extra base hit. Illinois, who is ranked #25 in the latest collegiate rankings, has been there much of the season since their success in Baton Rouge. The Buckeyes come in at #27 in the country, with a record of 34-13 (13-5 in the Big Ten). 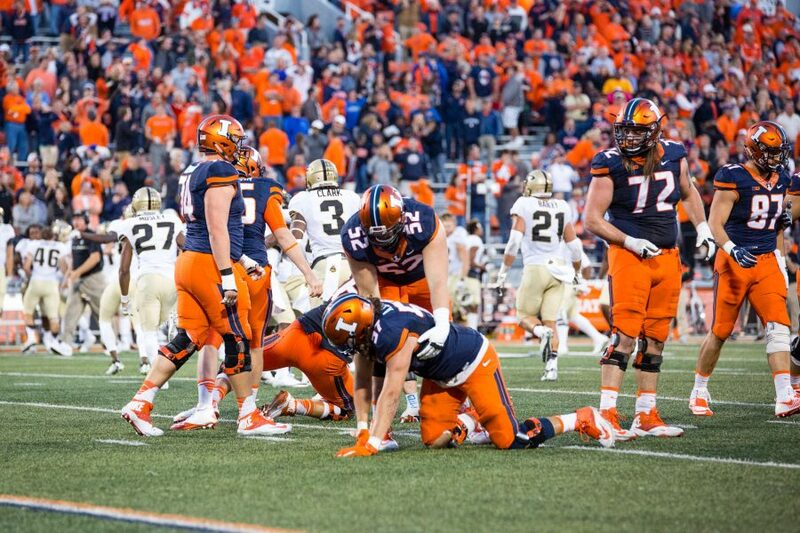 The Division of Intercollegiate Athletics have come up with another promotion that is sure to bring out fans in droves this weekend to see the Illini in action. On Friday night, the first 1000 fans in the stadium will be treated to free food as part of the Bleacher Bum Barbeque, with the doors opening at 5:00 for the 6:00 first pitch. As an added incentive, there will be free mini-bats given out to the kids, as well as drawings for Cubs and Cardinals tickets throughout the game. Finally, after the last out is made, the fans in attendance will be treated to a fireworks display. Admission to the game on Friday night will be free to all fans. Coach Terri Sullivan has been preparing her Illini women's softball team for postseason play, now that their regular season has been completed. The Illini finished the regular season with a 29-15 record, and a 12-7 mark in Big Ten play. The Illini swept the Minnesota Golden Gophers last weekend in Minneapolis, and will await the selection of the field for the NCAA Tournament, which will be on Sunday, May 10 (9:00 pm, ESPNU). With the record that the Illini have, they are sure to make the field and continue their season.